Brenna over at Showing Bones is hosting a giveaway! She found this lovely vintage fabric in her garage and is giving out 4 fat quarters to a random commenter - so go comment! 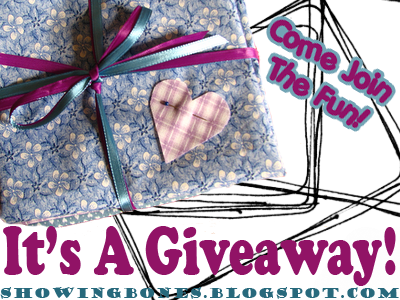 There are two ways to enter - by commenting and by posting the giveaway on your own blog - you can even use this handy-dandy graphic she made for us! Get your entry in by Monday, August 24th for your chance to win!